Martin Luther once said there are 3 conversions of man. The conversion of the heart, the conversion of the mind and the conversion of the purse, and the most difficult of these is the conversion of the purse. I grew up in a chuch that did not teach tithing. In fact, I had never even heard of it until I was 23 years old. I remember the first time I heard the pastor go on about the importance of the ‘tithe’. I thought, well if it’s important to God, then that’s good enough for me. So for the next few weeks I wore a necktie to church and felt pretty dang proud of myself. Imagine my surprise when I discovered I had misheard him and he was actually talking about the importance of the ‘tithe’ not the ‘tie’. “The tithe? What the heck is a tithe?” “10%?” “What’s he been smoking? I’m not giving the church 10% of anything?” It was funny how my pious obedience turned into abject rebellion when it turned out it was about my money. In retrospect I am not sure why it was such a big deal. I barely made any money anyway. My tithe might have been all of $10 a week. 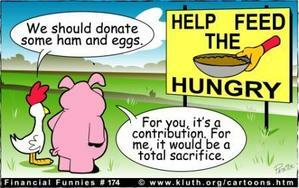 Because of my personal journey I am empathetic when I hear how Christians struggle with the concept of tithing. I understand what a huge mental block it is for so many. But, because of the personal experience with tithing over the last 27 years, I am also passionate about telling people of the rewards of giving to God what the bible says already belongs to him. Tithing requires something of a spiritual epiphany for most; a breakthrough in their thinking that this isn’t God’s plan to punish them, but a way to provide an avenue for financial breakthrough for them. I often ask our congregation this question. “How many of you can live better on 90% of your income than you could before on 10%?” The number of hands that go up is astounding. That’s because it is one of God’s most enduring principles. Those who argue that tithing is an Old Testament law miss the point entirely. Tithing existed both before (Gen 14:20) and after the Law (Heb 7:6). The point is that if we will honor Him with our finances to advance His work in the earth, He will bless us financially in return.